Stranraer is an attractive town in south west Scotland. The Rhins of Galloway is Scotland’s most south-western point. The climate in this part of Scotland is surprisingly warm. You will even see tropical plants growing here! It’s a peaceful, extraordinarily beautiful part of the country, with gorgeous landscapes, ancient Iron Age settlements, and plenty of Scottish castles to explore. The town of Stranraer is the largest settlement in the Rhins. The town’s history dates back to 1511, when Stranraer Castle was built by the Adair family. A settlement soon formed around the castle and today it is a thriving market town, popular with visitors and locals alike. Stranraer is a great place to visit if you are touring this part of Scotland. To help you plan your trip, here are some interesting facts about the town’s main attractions. For many years, Stranraer was the principle Scottish port for ferries to and from Ireland. In recent years, ferry operators have shifted their services to other Scottish terminals, but although this has affected the local economy, Stranraer is still a bustling little town, particularly on market days. Stranraer is dominated by the ruins the Castle of St John. The castle, which is right in the centre of the town, has undergone an extensive program of renovation in recent years. There is a museum containing a wealth of information about the castle’s past. Over the years, the castle has been a home, a fort, and even a prison. In fact, the roof was once an exercise yard for prisoners, who no doubt enjoyed the splendid views over the town and nearby Loch Ryan. Stranraer Museum is located in the former town hall. There are plenty of permanent and temporary exhibitions, including displays on polar explorer, Sir John Ross, as well as information on the area’s historical past. Indeed, if you want to learn more about the town’s interesting history, pick up a leaflet for the Stranraer Town Trail and follow the walk around the town’s historic buildings. Agnew Park is a great place to take the kids on a fine day. The park is located on the shore of the Loch. It has a miniature railway, adventure playground, paddle boats, go carts and an island. There is also a memorial to the 1953 Princess Victoria ferry disaster. If the weather is not so good, take the kids to the Ryan Centre. Here you will find a swimming pool, theatre and cinema, as well as a café. 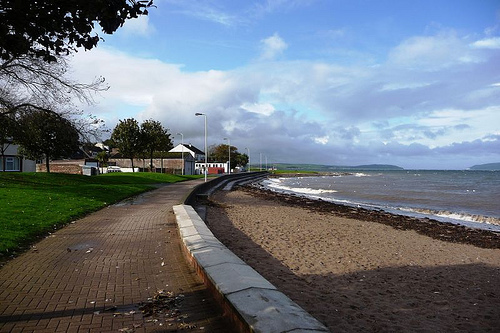 Stranraer sits at the head of Loch Ryan, a large sea loch. It’s a birdwatcher’s paradise around these parts, so take your binoculars and keep a close eye out for divers, waders, grebes and terns. You may also spot some grey seals basking in the early morning sun if you get up early enough. Nearby Knockquhassan Reservoir is also worth a visit – there are some fantastic views a short walk from the reservoir, if you follow the Scottish Upland Way.